23-30mmHg graduated compression helps alleviate pain from aching and swollen legs and helps prevent varicose veins often associated with pregnancy. Sheer, elegant, comfortable, and long lasting. We recommend this product to any pregnant women experiencing prominent varicose veins or fluid retention in their legs. These stockings will boost overall circulation so may also assist minor vulvar varicose veins as well as improving general leg fatigue. 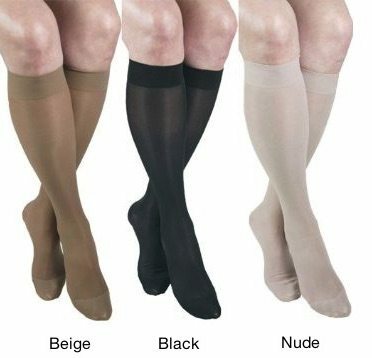 These Sheer Gabrialla maternity compression stockings offer 23-30mmHg of graduated compression (firm compression). This compression is firmest at the ankle and then gradually decreases up the leg. Varicose veins are gnarled, enlarged veins which appear close to the skin’s surface. Any vein has the potential to become varicose, but they most commonly occur in the legs and feet. For a lot of people, varicose and/or spider veins are simply a cosmetic concern. However, for other people, varicose veins can result in aching pain and discomfort. In some instances, the condition can lead to more serious problems. Varicose veins may also signal a higher risk of other disorders of the circulatory system. The Gabrialla maternity compression stockings are most suited to people who are currently pregnant or have recently given birth, are standing or working on their feet for long periods of time, as well as those who experience tiredness, aching, and swelling of the lower legs. Provides firmer support at the foot and ankle, where it’s needed most, and compression gradually decreases upward along the leg to the knee and thigh. Provides 23-30 mmHg graduated compression. Special elastic pouch easily expands to accommodate size changes. Reduce swelling, aching and tiredness of legs. Helps prevent development of varicose veins often associated with pregnancy. They are an investment in good health and last much longer than regular hosiery (with proper care). If you are unsure of which size to purchase, please Contact Us. For helpful tips on how to prolong the life of your graduated compression stockings, please visit our Caring for compression hosiery page.